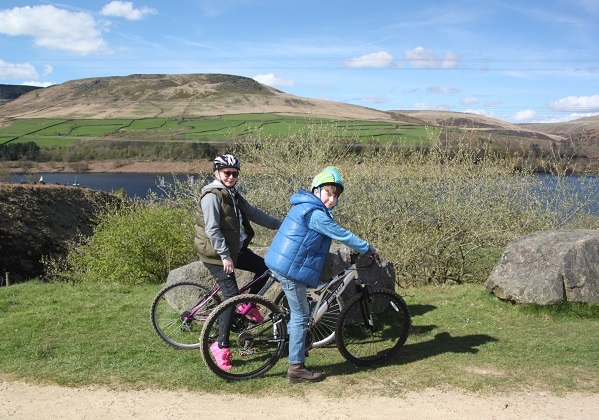 A chilly but bright Saturday, we decided to pack up our bikes, drive into the Derbyshire countryside and cycle along the Longdendale Trail, a 7 mile cycle track which was once an old railway line. 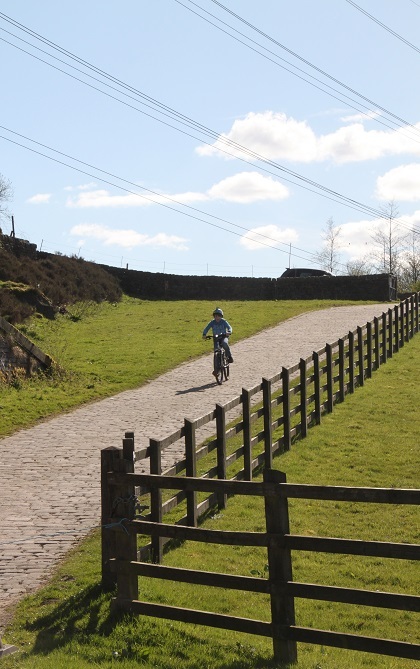 A safe off-road cycle combined with lovely views sounded just the thing. 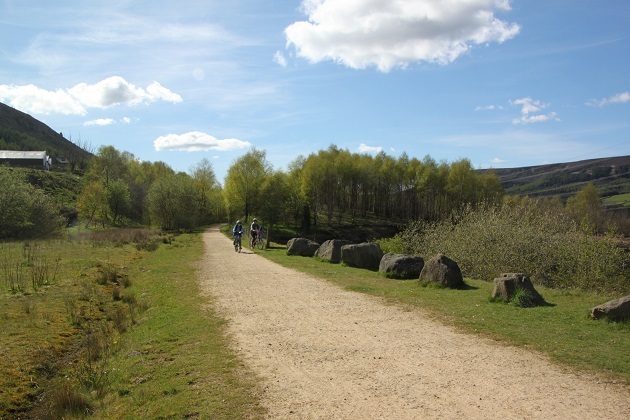 The trail is part of the Trans Pennine Trail and the route follows the course of the old railway line from Hadfield in Derbyshire to the Woodhead Tunnel. This was the first railway link between Manchester and Sheffield with the first passenger train in 1845. Hard to believe today that freight and passenger trains once thundered up and down this peaceful stretch of countryside. The line was closed in 1981 and subsequently turned into a cycle/walking trail. We headed for Hadfield, easily found the trail which was very well signposted all the way through the little town and were lucky to get the very last parking spot in the teeny tiny car park. The cycle track is 6.5 miles in each direction. 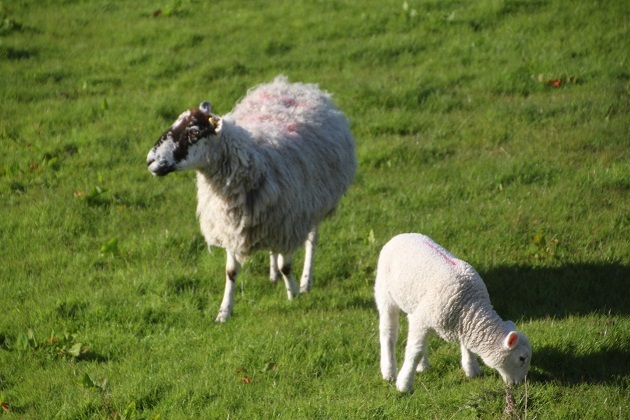 Amid groans from Son when he realised we would be cycling 13 miles, we set off and he soon forgot about the moaning when we spied meadows with cute baby lambs. 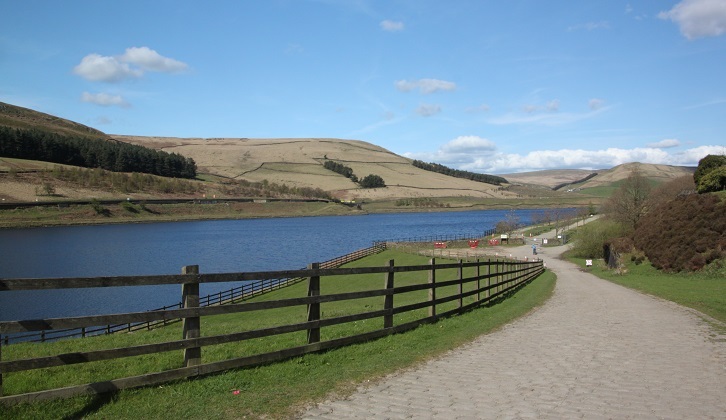 The scenery was instantly captivating – rolling green fields then a string of reservoirs at the bottom of the valley. 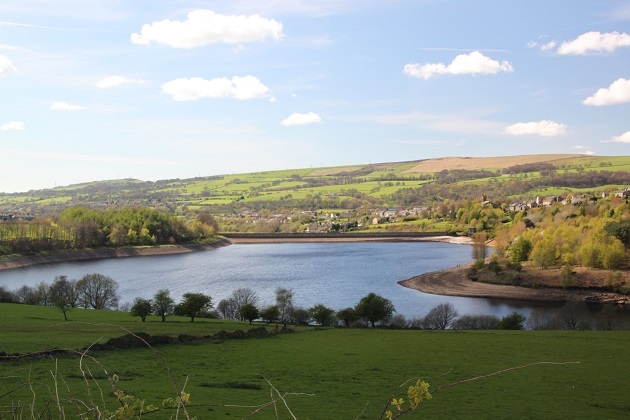 The 5 reservoirs were completed in 1877 and with the sun shining on them looked stunning. The only slight shame was those pylons that run parallel with the trail – a blot on the otherwise perfect landscape. A refreshment stop halfway was of course essential, then we clambered back on our bikes and cycled to the Woodhead Tunnel. This is a series of railway tunnels, 3 miles long but now closed and the point at which we had to retrace our steps. A short rest then it was back on the bike for the 6.5 mile return leg. The cycle to the tunnel – described as flat and it didn’t look like it ascended at all – had left me feeling slightly out of puff the whole way, we needed to work fairly hard and Son moaned a lot. What we hadn’t realised was the railway path had a slight incline the whole way. A bit of a work out but wonderful for the way back – free wheeling and downhill all the way got a thumbs up from all of us. 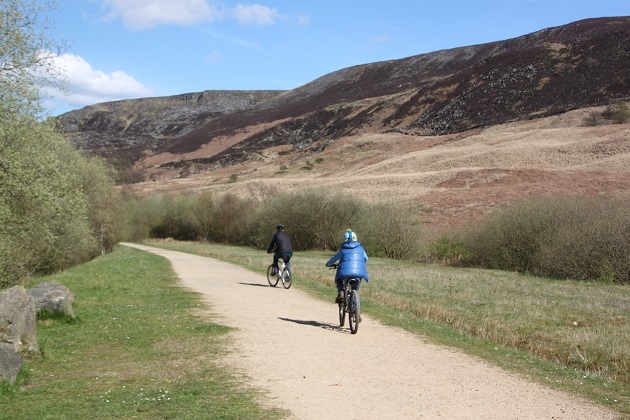 It was a gorgeous cycle – took our minds off the uphill bit!! These ones are really big!! Looks lovely! Reminds me on how I should cycle more, it’s a great way to see places. 🙂 Happy weekend! Same to you Suvi – hope your weekend is a great one! We were hoping to cycle again but the sunshine we had all week long has changed to rain!! Sound like Finland, same thing happening here, cold too. It was great – no traffic, (fairly) level path but the views all the way were so beautiful that you forgot any tough parts!! This looks perfect! Fairly easy biking and such amazing views! It was – although that little incline had us fooled but freewheeling the whole way back and just soaking up the views with no effort whatsoever was amazing. Lovely scenery and a good way of getting some exercise. 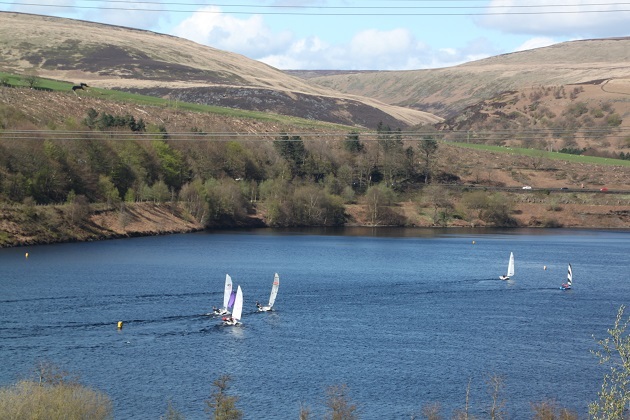 My husband childhood home overlooked a reservoir and he and his brothers enjoyed many happy hours on their sailing dinghies there. It’s drizzling here, too this morning – let’s hope it clears up soon! Sounds like the perfect place to grow up and learn to sail!! The grey skies are so disappointing today – and for the weekend!! After all that lovely sunshine I think it’s even harder to take!! That’s why I love bike rides, because you really get to see such amazing scenery! My son has now mastered riding a bike, but think this would be a stretch too far! Won’t be long though – I remember when our son just got to grips with his bike and before we knew it he was whizzing ahead and we were able to do family bike rides in no time. This one was great – I love the old railway lines with no traffic and the fact they are reasonably flat! 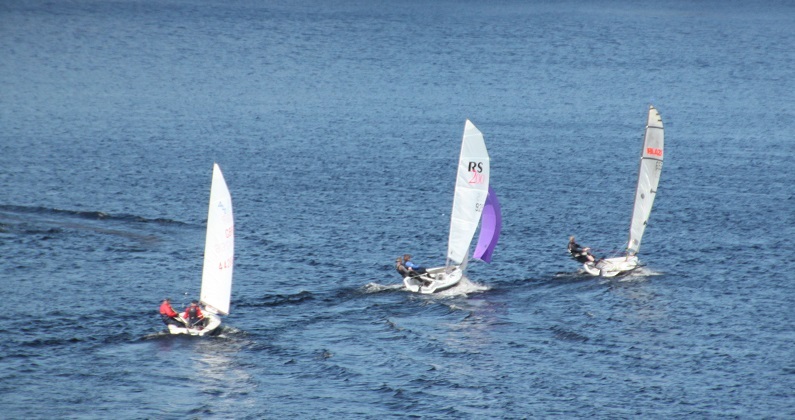 You should try Rutland Water. 25 miles or so all the way round! It was a lovely day out Rosemary – despite our son’s initial groaning he soon forgot and had a lovely day too, so much to see you couldn’t help but be impressed. The weather was chilly but bright – that’s sometimes enough here!! Think we’re in for some rain and cooler temperatures – all that lovely sunshine seems to have disappeared. Have a lovely weekend. What a day! I’d be saddle sore for days afterwards. 🙂 The countryside is gorgeous though so it would be worth the work-out. It actually wasn’t too bad as far as exercise goes – although the way our son groaned you wouldn’t have thought so – but definitely the views were so stunning it would have taken your mind off anything! Joy, what a lovely bicycle trip…family fun and beautiful views! I remember when our (now 30 year old) son loved when we rode bicycles on vacation! Happy weekend! We try and get our bikes out as much as possible Pam, as you say it makes for a fun day out and you get to see a whole lot more on a cycle ride. Hope your weekend is a lovely one too. So peaceful! My husband takes my girls for rides every weekend..as soon as my leg is better I can’t wait as this is the first year my younger daughter can bike far. A great way to take in a lot of scenery! We love cycling too although this year haven’t done quite as much because of the weather. It is a fun family day out though – sorry you’re missing out on the cycles but hope your leg is mending fast!! Oh how I wish I could cycle there too! Gorgeous scenery! Isn’t is stunning – something really lovely about cycling near water I think. It was wonderful George, the views are magnificent and we had the whole place to ourselves it seemed. A perfect cycle! I love cycle trails like this. We did a multi-day one here a few years ago and I still rave about it! Lovely pics. 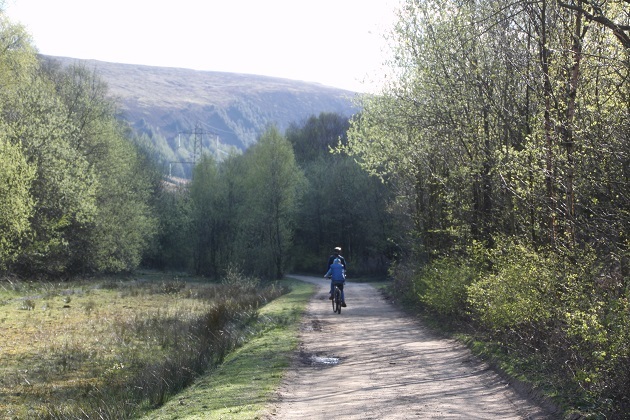 Thanks Hayley – it’s so peaceful and beautiful and you get to see so much more in detail from a bike. We loved it too! It looks beautiful!! Once we have travelled as much of the US as we can, we really hope to see Great Britain someday! There’s just so much to see in the US though – we love it! That there is! It’s almost been difficult deciding where to go next in our travels! Love those sceneries. Thank You.